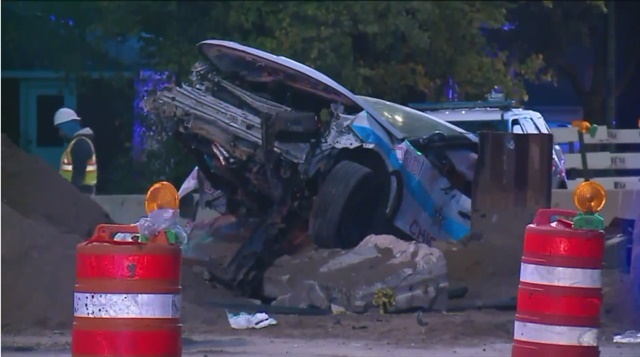 Two Chicago police officers were injured after crashing into a construction site on the city's South Side early Thursday morning. The police SUV crashed through a concrete barrier, then dropped into a hole dug into the intersection for sewer work, trapping both officers. The officers had to be cut out of the wreck by firefighters. The 33-year-old officer injured his arm, and the 25-year-old officer injured his arm, hip, and leg. It is unknown at this time how exactly the crash happened. The police union president told WGN TV the officers were not in pursuit of anyone.